This is Beijing type wok that Chinese cooks use for stir-fry dishes. Our shop's item is made by hammering. Hammering makes products strong. Products are made from 1.2 mm steel plate and those made from 1.6 mm steel plate. 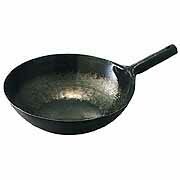 The wok made from the 1.6 mm steel sheet is strong and excellent in heat retention. However, many cooks use 1.2 mm wok because it is lighter. The products are made by Yamadakogyosho in Yokohama which is known for its quality. In addition, products are close to handmade, there are some variations in size and weight. Please understand in advance. How to choose a good wok etc. Wok is painted in anti-rust paint. At first user has to burn the wok to remove paint. Burn all over a wok over a flame. Then pour much oil into wok and fry vegetable garbage with using all inside wok. Use wok after abandon vegetables and wash it in hot water. In case of using home gas table with safety censor (Si censor gas table) manufactured after April 2008, the burning work may not be possible. In this case, please do the burning using the cassette stove. Except in special cases, the appropriate size of the wok used at home is 27 to 33 cm. Please decide the size of the Chinese pot, considering the balance with your gas table.